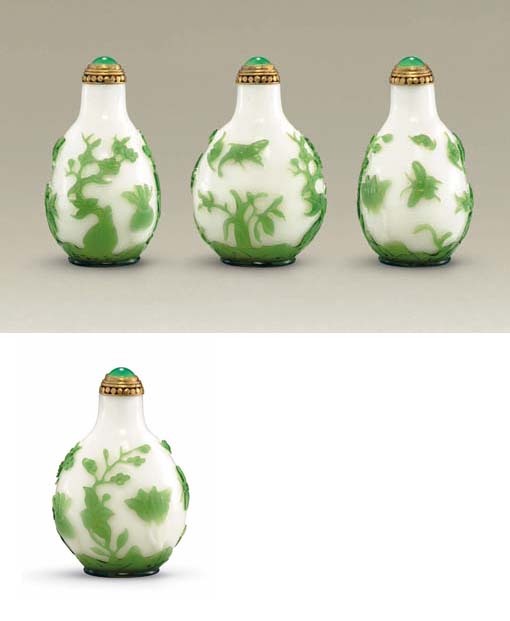 The exceptional quality of the carving on this bottle sets it apart from the rest of the overlay glass bottles produced in Beijing. Unusually well carved and finished, the design is elegant, well composed and displays a painterly, artistic touch which is more commonly seen in bottles produced by Li Junting and his Yangzhou-based school. The treatment of the bats and butterflies, combined with the delicate variation in the depth of carving, would seem to suggest that certain Beijing styles in glass overlay may have inspired the artistry in Yangzhou, as this is similar to some of Li Junting's early work. See a blue overlay glass snuff bottle from the Bloch Collection, illustrated by Moss, Graham, Tsang, A Treasury of Chinese Snuff Bottles, Vol. 5, Glass, no, 916, which was also produced at the Imperial glassworks in Beijing, and is similarly carved. The bat is a symbol of happiness and good fortune as the word for happiness (fu), is pronounced the same as the word for bat. The inclusion of the blossoming prunus expresses a wish for longevity (and represents, alternatively, the perfect gentleman). Adding to this visual pun, the butterfly (die) reinforces the idea of a long life, as it is a homonym for a septuagenarian or octogenarian.